It’s Official 230 days to go… YIKES! I look at the lists and spreadsheets we have created and it frightens me how much there is still to do. January, whilst it has gone very, very quickly has been an incredibly productive month though so I should stop worrying! 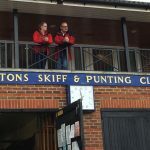 The lovely Malcolm Knight who is the current record holder welcomed us to his club, Thames Ditton to do some filming for the promo video. He was just brilliant, so relaxed chatting to camera and showing me the boat he used when he rowed the Thames in 2005. It brought home to me once again how big this challenge actually is. Training has definitely stepped up this month and I am starting to appreciate how lucky I was not having to train and work when I was in the GB Para-Rowing squad. I am not training anywhere near the amount I was then… but I am still knackered! Plenty of ergos, circuits, running, core and water sessions under my belt though and I am starting to feel slightly rowing fit again… It feels awesome! A good friend, Helen Jacob has agreed to create The Great Thames Row 2016 logo. Another mate has arranged for his company to print all the posters, fliers, banners etc; and one of the companies they used has offered to help with the lay out designs for all those things. We potentially have a big launch to use, now we just need a small one to get close to me en route. In total so far we have 55 people who have volunteered to help and someone who is willing to manage the volunteer side of things. So, wow, putting it like that… we have done SHED LOADS!!! Lastly and most importantly, this month we’ve had CONFiRMATION FROM GUINNESS… now it is really real!!! The Guinness Book of World Records have named it, ‘Fastest time to row the river Thames in a Single Scull (Female)’ and this has to be done in 50hours or less for them to acknowledge it. Having confirmed that they will recognise a ‘female’ record does take the pressure off a little. We are working off Malcolm’s timings for the row and the competitor in me wants so much to beat him but at the same time if I don’t I still get a record and either way, he remains the holder of his record! If you would like to know how you can get involved in this, please contact us at info@in-vision.org.uk and we can send you all the information you might need.